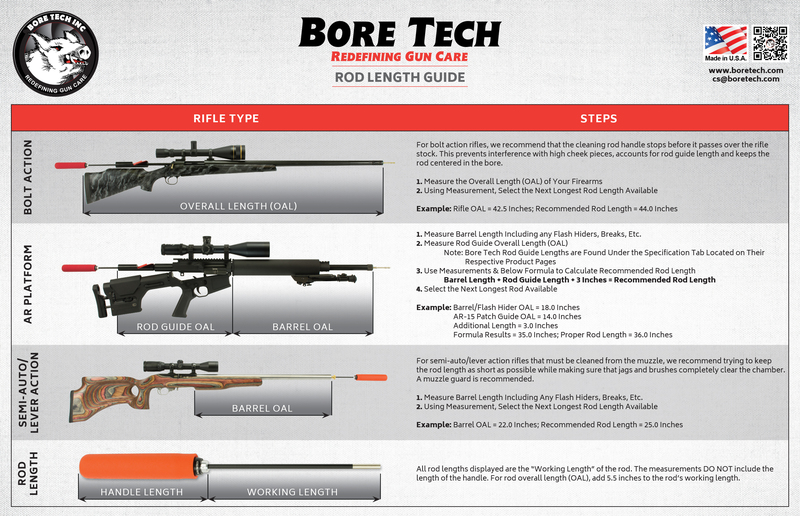 Bore Tech Rimfire Bore Guides will add approximately 10.5 inches to the length of the barrel when cleaning. Make sure your cleaning rod is long enough to accommodate. 2) Insert Bore Guide through the receiver until seated against the base of the chamber. 3) Position a dry patch of the proper size on a jag and insert the rod/jag into the rear opening of the bore guide until viable in the solvent port. 4) Apply cleaner or oil to the patch and push through the bore. 5) The solvent port may also be used to apply cleaner to brushes. 6) To remove the Bore Guide from the action, pull the guide back away from the chamber and out of the action. NOTE: For Rimfire actions with exposed bolt releases/sears it may be necessary to pull the trigger while attempting to remove the guide. This releases the pressure against the guide allowing it to be easily removed. Q: Will these Bore Guides work on centerfire rifles? A: No, these guides only fit specific rimfire, bolt action rifles. Please see our Centerfire Bore Guides for this application. A: The Rimfire Bore Guides are approximately 10.5 inches in length.